STOP! Wait for the cars to slow down and make sure you cross safely . 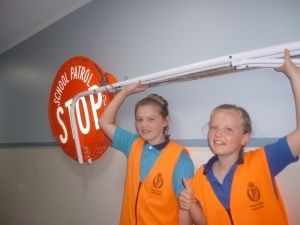 Some Year Six Students at Onerahi School are making sure it’s safe for you to go across the road.The Year Six Students that are doing Road Patrol will be wearing bright orange vests. They will put their signs out when it’s clear and you will be able to cross after they have said ‘check, clear, cross now.’ They get many people crossing the road before they get to say it so can you please cross the road after they have said check clear cross now.They use Their mornings and afternoons to help people go safe across the road. They help you by making sure that you don’t get hurt when you cross the road. If there weren’t road patrollers you could get hurt pretty badly and we don’t want that to happen to anyone. This is what the road patrollers will be wearing bright orange vest and also the back gate will be using there hands as signals to tell the cars to stop for the people to cross. The front gate will be using signs for the cars to stop so please follow these instructions and don’t cross before they have said check clear cross now. 1.Why are the patrollers doing their job? 2.What do the patrollers wear? 3.What colour are the vests they were? 4.What words do the patrollers say before you cross? 5.Create a thank you card for the patrollers and why their job is important?